Campaigners in east Kent are vowing to fight proposed changes that would see local hospitals lose major services. The NHS is asking local people about two options for the three hospitals in Ashford, Canterbury and Margate. Option one would see specialist services consolidated at Ashford's William Harvey Hospital, with more day-to-day hospital services at the others. The second option would see a new hospital built in Canterbury and A&E downgraded at the other two. Carly Jeffrey, of Save Our NHS in Kent, said all three hospitals should have an A&E. "I think most people feel that what we need is an option that suits everybody and works for everyone, so as it's early in the day we don't think anything should be taken off the table yet. "We want to see a third option included in the consultation when it takes place, and that option must include a full A&E for each of the three hospitals," she said. Option two also includes consultant-led maternity services being relocated to the Kent and Canterbury Hospital in Canterbury. There would still be a range of maternity and children's outpatient services provided at William Harvey and Margate's Queen Elizabeth the Queen Mother Hospital, including clinics and antenatal day care. Under both options, the NHS aims to open further urgent treatment centres in east Kent by December 2019. The proposal for a new hospital in Canterbury follows an offer from a local developer to build the shell of a new hospital as part of a development of 2,000 new homes and gift it to the NHS. NHS managers said it could lead to improved outcomes for patients, along with shorter waiting times in A&E, and would help boost recruitment and retention of the best staff. 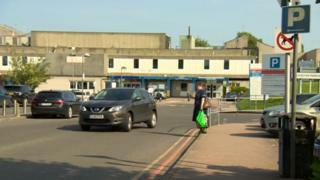 Concern for Health in East Kent has campaigned for a new hospital in Canterbury for the past 20 years. Spokesman Ken Rogers said: "This is the only place in east Kent that clinically is the best place for all patients in east Kent." The NHS in east Kent is holding a series of eight public listening events as part of wider pre-consultation engagement on the potential changes.